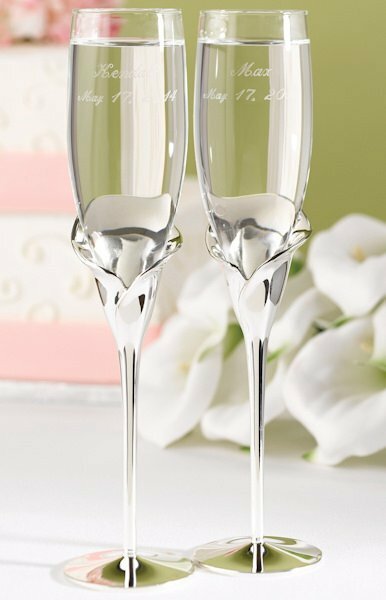 These graceful toasting flutes feature slender, silver-plated stems that open up into a stunning calla lily base. The glass bowl fits perfectly inside each flower, the overall effect is perfect for your outdoor wedding or floral-themed event! 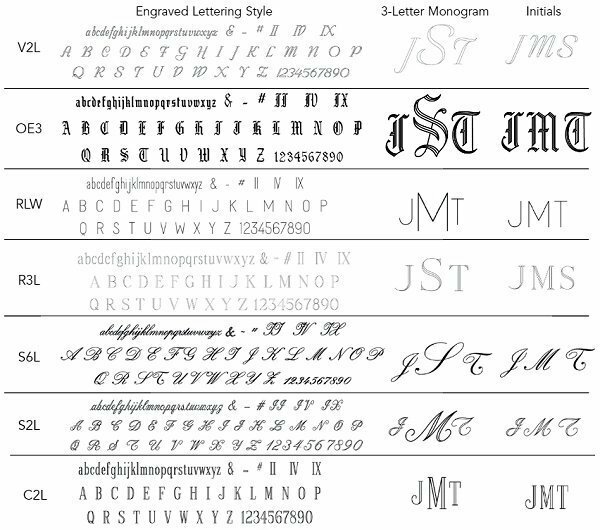 We will optionally engrave each flute with your choice of names and event date (as shown) or a single initial. Standing 10 1/2" tall, each flute holds 6 ounces of bubbly. Note - We sell the matching cake serving set with calla lily handles separately. Is there anyway I can have a Butterfly engraved on each flute? These Toasting Flutes with Calla Lily Base are sold in sets of 2 so if you order 1 set you will receive 2 flutes. 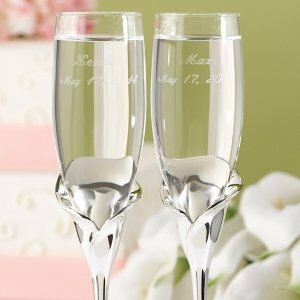 Hi, I am personalizing wedding toasting flutes, how can I preview before ordering? We don't have actual proofs or previews for this Toasting Flutes with Calla Lily Base, but you can view the examples pictured, as well as label designs and colors using the links under the description. There's also links for these options in the personalization section of your shopping cart. I previously ordered the Calla Lilly Toasting Flutes for my daughter's wedding and her fiance became gravely ill in May, two weeks before the wedding. 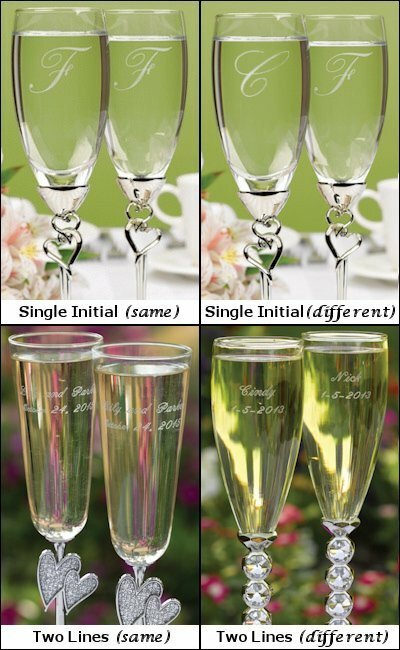 The wedding has been rescheduled for Nov. and I would like to find out if a discount might be offered to repurchase the Toasting Flutes- Order #180131-1093. Thank you very much for your consideration. Hi Nancy, you've ordered the Toasting Flutes with Calla Lily Base at a price of $45 and now it is offered at a price of $33.92. You will be getting a great deal if you purchase it online as we offer it cheaper this time. Hello can I see a sample of the glasses with Faye and Dre 12/14/19 on the item? Unfortunately, a sample is not available with this Toasting Flutes with Calla Lily Base. Also, for other sample orders, you will not be able to specify personalization. Your item will consist of a random representative sample.